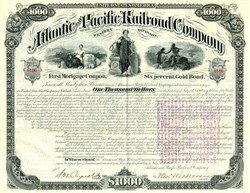 Beautiful certificate from the Atlantic and Pacific Railroad Company dated in 1880. This historic document was printed by American Banknote Company and has an ornate border around it with a vignettes of Lady Liberty with a shield, indians, and a woman sitting next to money bags. This item has the signatures of the Company's President, Thomas Nickerson and Secretary, S. W. Reynolds and is over 135 years old. 35 coupons attached on bottom. Thomas Nickerson (September 19, 1810 � July 24, 1892) was the eighth president of the Atchison, Topeka and Santa Fe Railway between 1874 and 1880. He was also president of the Atlantic and Pacific Railroad. The Atchison, Topeka and Santa Fe Railway (AAR reporting mark ATSF), often abbreviated as Santa Fe, was one of the largest railroads in the United States. He was born in Brewster, Massachusetts, on September 19, 1810. His family was well known for the number of sailors it had produced, and Thomas himself also sailed for nearly 30 years before he turned to land transportation. He invested in the Santa Fe around 1870, becoming the railroad's vice president in May 1873. The next year he was promoted to president of the Santa Fe, succeeding Henry Strong, where he served until 1880. Nickerson didn't limit himself to just the Santa Fe. He was also a prominent figure in the Atlantic and Pacific Railroad, Sonora Railway, California Southern Railway and Mexican Central Railway. Nickerson died in Newton Center, Massachusetts, on July 24, 1892. The town of Nickerson, Kansas, founded in 1872, is named in his honor. Nickerson is a city in Reno County, Kansas.